Your hosts Linda and Greg Marshall are locals who have converted their large villa into a luxury lodge and are committed to guests having a relaxing and enjoyable time and will endeavor to help achieve this. The Lodge is within easy walking distance of a number of restaurants and cafes,pubs and main street shops. Te Aroha Mineral Spas are conveniently located right next door. The walking and mountain bike tracks start from the gate. We also provide a number of services for the Hauraki Rail Trail including bike hire. At the end of your day, enjoy a nice glass of wine on the verandah watching the sunset. Aroha Mountain Lodge can cater for up to 12 guests – The Verandah Wing has a choice of three themed en-suited rooms; The Beach House, Country or Sunset Room. The Villa Wing has three double rooms, one with en-suite plus a feature bathroom complete with clawfoot bath. Your stay in any of our luxury rooms includes an optional breakfast served at the dining table. A full kitchen and guest lounge with Sky TV are also available. In total twelve rooms are available over the Lodge’s three locations. The accommodation has private off-street guest parking & free wireless internet access. Local attractions include: hot soda water spas, hot pools, massages, the world’s only hot soda geyser, historic museum, antique shops, 10km all weather mountain bike track, walking in the Waiorongomai Valley, 18 hole golf course and Hauraki Rail Trail. 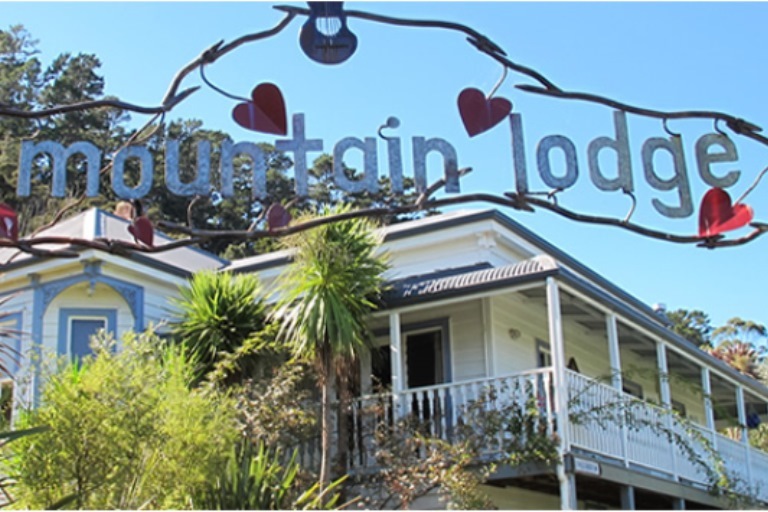 The Aroha Mountain Lodge can be booked in conjunction with the The Chocolate Box and The Hot Springs Lodge to provide a total of 12 rooms. Double: $145 per night. With breakfast: $185 per night. Single: $135 per night. With breakfast $155 per night.